Trane has been manufacturing high-efficiency, integrated home heating systems for more than a century. A key component to any Trane furnace's efficiency is the proper operation of the unit's pilot light, which ignites the burners to heat a home when they're signaled by the thermostat that the room temperature has dropped below the desired level. When the pilot light has gone out, relighting it is a simple and safe procedure. Set the central furnace thermostat to "Off" or the lowest temperature option. Access the furnace controls by opening the metal door at the bottom front side of the Trane furnace. 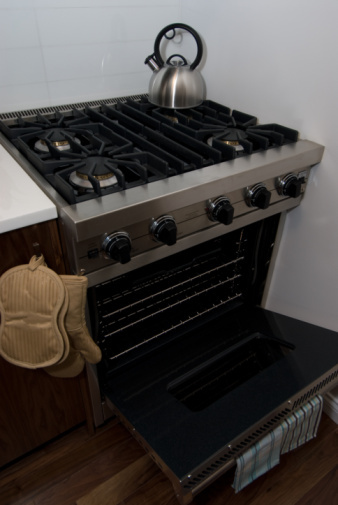 Rotate the gas control dial to the "Off" position and wait five minutes to allow any residual gas to dissipate. Locate the end of the pilot light tube. Trane pilot light tubes are found toward the rear of the chamber, below the furnace burner coil, with the brass tip pointed upward at a slight angle. Set the pilot light control dial to "Pilot," and then depress and hold down the dial. Hold the flame of a fireplace lighter or match at the tip of the pilot light tube to ignite the flame, continuing to hold down the control dial for 90 seconds. Release the gas control dial and turn it to the "On" position, with the pilot light remaining lit. If the pilot light is extinguished when the control dial is released, repeat Steps 5 and 6. Close the furnace access door.